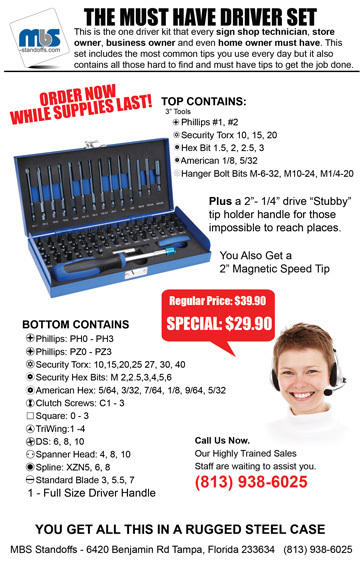 MBS 68 Piece, Sign Professional, Bit Driver Set. If you are a sign installation professional, or small business owner, this set of bits is what you need to work smart and efficiently. One of the most preventable wastes of time and money is making sure you have the right tools for the job. Have you ever had to leave a job to drive to the nearest home improvement store for a tool? While you are not working you're losing time that is money that once it is gone you don't get back. To prevent this, make a small investment now for this 68 Piece driver set and you will have the most commonly used specialty bit drivers in use today. But what makes this set so useful is it also has the most common everyday bits that you use all the time. From the #2 and #3 Phillips tips to the standard blade tips you will use this set every day. One of the other great features is in the magnetic locking and quick-release handle. Just lightly press the tip into the handle and it will get locked firmly into place. To release, simply slide the blue ring to the end and it will release the tip while popping it out so it is easy for you to grasp. At the same time it still holds the tip firmly with a magnet so you don't drop and lose your bits. It won't come off until you take it off. Included in the set are a speed tip for a cordless drill and a stubby handle for those difficult to reach places. Making this your every day set of bit driver.